The military has been in a unique position in terms of gathering and holding medical data for 300 years. Sadly, the biggest leaps and advancements in medical technology throughout history have often coincided with conflict. These conflicts have occurred all over the globe, exposing humanity to diseases that were neither indigenous to location nor the combatants, importing and exporting harmful viruses, bacteria and infections across the world. The data also includes dental and veterinary care over the same period. The uniqueness and historical significance of some of the material includes artefacts like Florence Nightingale’s original passport (travel documents) to and from Crimea. Neil MacOmish explores how The Museum of Military Medicine is not only the depository of this knowledge and historical artefacts but is a centre for change and advancement. Over 3,000 researchers and thousands of school children visit a rather pokey and inaccessible facility that sits within the security cordon of the Keogh Barracks in Aldershot, England. 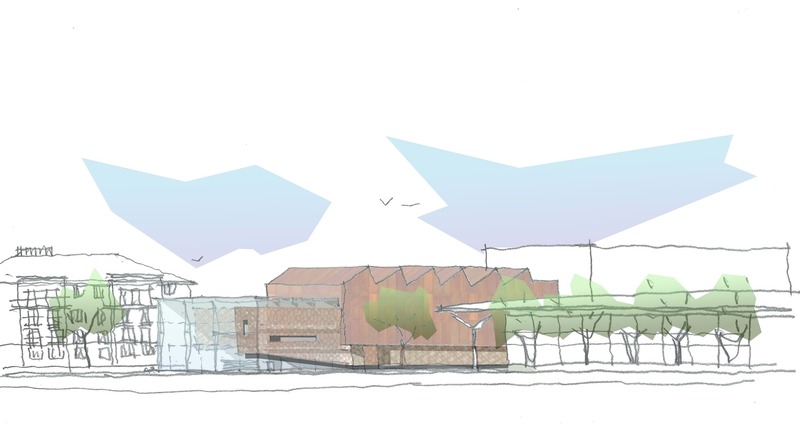 This is all to change with the space at Keogh being required for operational requirements and a new museum planned to be relocated to Cardiff Bay. The site is currently a rather anonymous and uncontained piece of hard landscaping on the corner of two roads in Cardiff bay. One of the roads however, Lloyd George Avenue, is one of the major routes that connects Cardiff City centre to the Bay. The site also faces Cardiff Bay railway station; this is an important part of the design response as the station was used as a transport hub for wounded soldiers during the Crimean and both world wars to distribute them to hospitals and hospital ships in the harbour and the city. The site is also close to other historic and cultural icons within the city, such as the Wales Millennium Centre, The Coal Exchange, The Senedd (Wale’s devolved parliament) and the Pier Head Building. However, it also sits adjacent to one of Cardiff’s most dis-enfranchised yet diverse communities of Bute Town, but equally on a threshold of newer, more affluent residential development. The building’s response to these contextual parameters is also an important design driver. The museum could be seen as just a depository or container for these precious artefacts – at a dumb level an introspective ‘black box’. Certainly, the functional requirement for lots of the material and exhibits requires sensitive enclosure and a degree of environmental inertness. However, the museum wants public and community engagement and therefore an expression of transparency and openness is essential to suggest that the facility is indeed open to all. The building is clearly a depository of knowledge – but through the organisation and programmes that will be held within the facility, dissemination of that knowledge becomes relevant and accessible. This programmatic and functional arrangement is at the very heart of learning. We have a human desire to learn – we look for where that knowledge may be held – we then seek it out and ‘consume’ it, making it our own then in turn, transfer it to others. We have therefore followed an architectural expression that follows the very simple spatial syntax of moving from public to semi-public, then into the private domain. This manifests itself in layering transparency, translucency and opacity into both a spatial and linguistic composition. There are in fact these types of artefacts that imply three types of visitor experience. The most environmentally sensitive are the paper archives. The response to this requirement is to create a ‘box within a box’ that offers the best protection and climatic inertness. There are then exhibits that require the next level of environmental protection (light sensitivities and temperature/humidity) that also require “a suspension of reality” – a state that is termed an ‘immersive experience’. This detaches the visitor temporarily from reality and transports them to another time and place. The third are then objects and exhibitions that benefit from controlled natural light (either diffused or vector quality light for “sculptural” objects). These functional requirements generate the three types of space that can be found in the plan and section – three layers of the overall. As with all good museums, the connection of the spaces enables either a prescribed route to be followed – perhaps a timeline or similar – or one of choice, where you can jump from one exhibition to another, dependant on your own interests, revisit bits you have missed, want to see again or are part of a specific education or research programme. The introduction of the connecting ramp is an important design element in this regard. It acts as a processional route and is part of the museum narrative. It also plays a role in the architectural experience in terms of kinaesthetic. The back of the knee is one of the most sensitive parts of the body in imprinting a pleasurable spatial experience (the other being the back of the neck). The movement required up or down the ramp accentuates this physical aspect of memory. The ramp and the gallery balconies also enable a different perspective of some of the larger exhibits (particularly for children), offering elevated views from different levels. 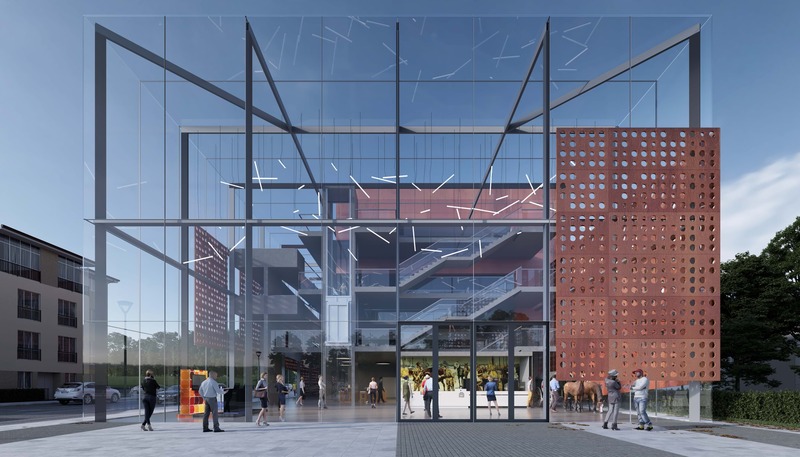 The open and transparent atrium space that faces out on to a new plaza and facing the historic railway (physical and intellectual engagement with both subject and history) also acts as threshold and transition from one world to another. Cardiff Bay’s cultural and social heritage is woven around its history as a port and industrial area. The idea of a ship or industrial container as an appropriate vessel to hold the exhibits and artefacts is used to root the building within its ‘genius loci’. To this end, the main body of the museum is conceived as a floating industrial form with the expressed north lights covered in corten steel cladding. This is then subsequently wrapped on two sides by the glazed atrium entrance and circulation spaces – enabling movement to be perceived by the passer-by – adding life and activity. In turn this is partially sheathed in a perforated copper veil. This acts as both a climate modifier (solar shade) as well as a further expression of the concept (the translucency aspect of the semi-private). 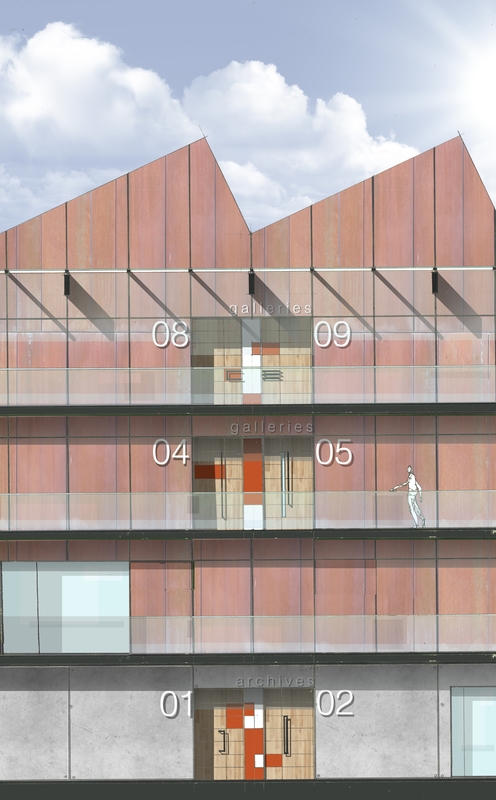 Both the corten and the copper make a further subtle reference in colour tone (in a contemporary and abstract way) to the Pier Head building, as a beacon within the overall fabric of Cardiff Bay. 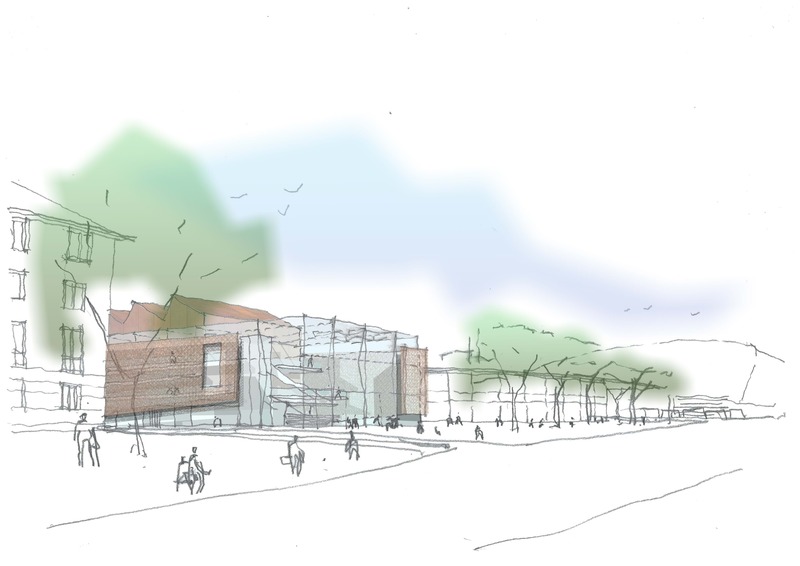 The café, reading room, auditorium and other functions will be open for community use – and a bespoke room specific to the local community is also included. 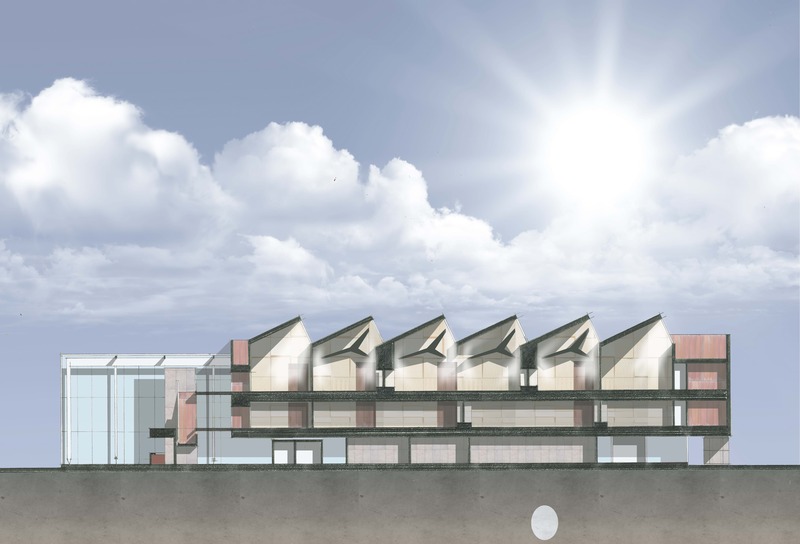 Because of the clients’ desire to impart the collective knowledge of 300 years of medical research to the medical and pharmaceutical professions and the community, the building is required to be more a simple storage box. It has to be an architectural jewellery box – something that someone wants to open, to look inside – the act of discovery and learning.